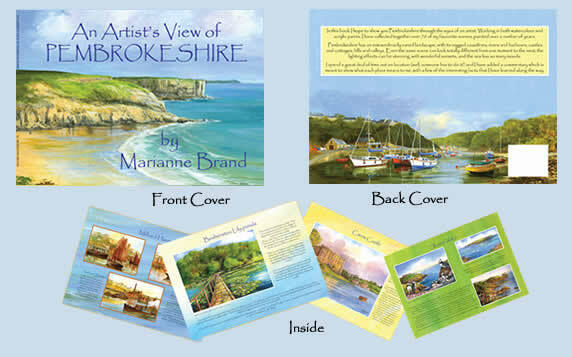 This 48 page full colour book features many of the beaches on the Pembrokeshire Coastal Path, harbours, towns, castles, rivers and of course, the wonderful Preseli Hills. It is not meant to be a comprehensive guide book, but simply all my favourite places in Pembrokeshire, with some of the interesting facts I have learnt along the way. The pictures are either watercolour, or acrylic, and have been reproduced to a high standard by Gomer Press Ltd in Llandysul. The book has done really well, selling all over Pembrokeshire, as well as in other parts of Wales. Copies have been sent by customers to friends and family all over the world, and I have had wonderful messages from people for whom it has brought back happy memories of Pembrokeshire. At the launch of the book in July 2006, gust of honour was Andrew Davies AM, Welsh Assembly Minister for Tourism, and he praised the book for bringing Pembrokeshire, and Wales to the attention of the world. In summer 2007 I launched a new book - 'An Artist's View of Cardiff and the Vale of Glamorgan'. 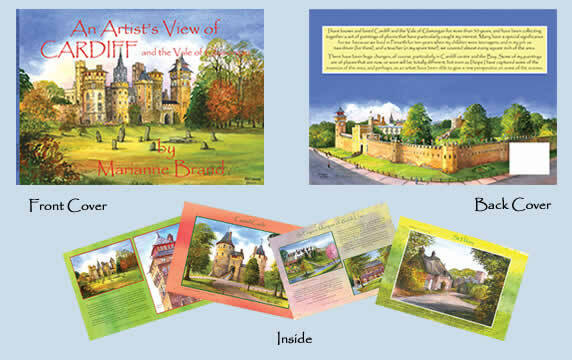 Again it has 48 pages of full colour paintings, many gathered when I was teaching in Cowbridge, and many more done over the years since, showing many of the changes that have taken place in that beautiful city and its surroundings.